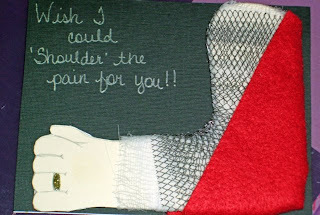 This card was made for MIL after she had shoulder surgery. Husband drew me off a template for the arm and then we wrapped it in gauze type material and wire to mock a cast. Sling is made from felt and then it all attached to the front of the card. Ring is made from stickles.